Pancake Day is easily one of our favourite days of the year. It’s a time to treat yourself and really indulge, and it’s easier than you think to do this as part of a healthy lifestyle. Instead of reaching for the chocolate or sugar, why not try one of the exclusive pancake recipes we’ve created below? They’re packed full of healthy nutrients and best of all, they taste great. 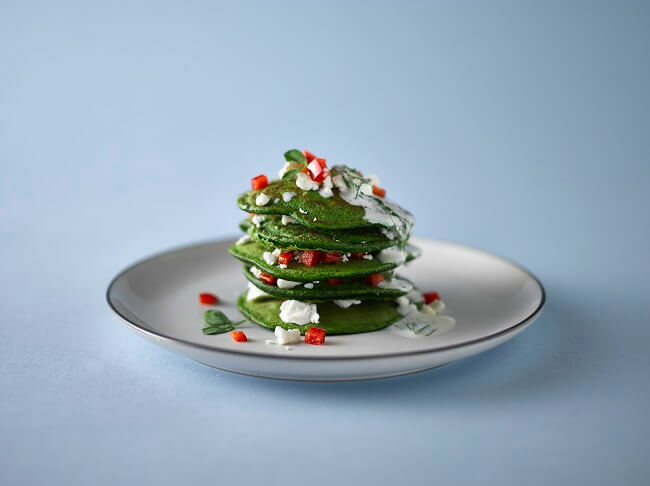 We all know green veg is good for us, but we bet you never thought you'd see it in a pancake? Well, these super-green pancakes are bursting with fresh flavours that are sure make your Pancake Day special! Mix the spinach, mint, eggs and almond milk together in a blender until you have a smooth, vibrant green mixture. Add the sieved buckwheat flour and mix well. Give your pancake batter another good mix. This will work air into the mixture and give you a fluffier pancake. Drizzle a little of the rapeseed oil into a pan and preheat it to a medium heat. Pour enough of the batter into the centre of the pan for your desired thickness. Remember that it will naturally expand when it’s heated, so don’t add too much! Leave to cook for 2-3 minutes until slightly golden on one side. Fry for another 2-3 minutes until the other side is also golden. Repeat steps 5-9 until all your pancakes are cooked. Crumble your feta cheese over the top along with the diced peppers and serve! Why are these pancakes great for your health? Vitamin A (eggs, spinach) - Helps your immune system, improves night vision and gives you healthy skin. Vitamin B6 (spinach, red peppers) - Uses and stores energy from protein and carbs. Vitamin C (spinach, red peppers) - Protects cells and heals wounds, while it's also famously important for healthy gums. Vitamin E (eggs, spinach, rapeseed oil) - Good for your immune system, skin and eye health. Also a natural antioxidant. Vitamin K (eggs, spinach, red peppers) - Helps with blood clotting, which is important for healing wounds. Carotene (mint, spinach) - Supports eye health, can be converted into Vitamin A by the body. Not all fat is bad. In fact, it plays an important role in your body, provided you stick primarily to the unsaturated fat found in feta cheese and rapeseed oil. The rapeseed oil in this recipe contains 50 per cent less fat than alternatives such as olive oil. This will help keep your cholesterol level down and reduce your risk of heart disease. Feta is much lower in calories and saturated fat than other hard cheeses, such as cheddar, so it’s a healthier way to get calcium into this dish. Meanwhile, eggs are rich in omega-3 fatty acids, known to help reduce the level of triglycerides (bad fats) in your blood. They also contain HDL cholesterol, (the good stuff) which helps remove LDL cholesterol (the bad stuff) – reducing the risk of cardiovascular diseases. 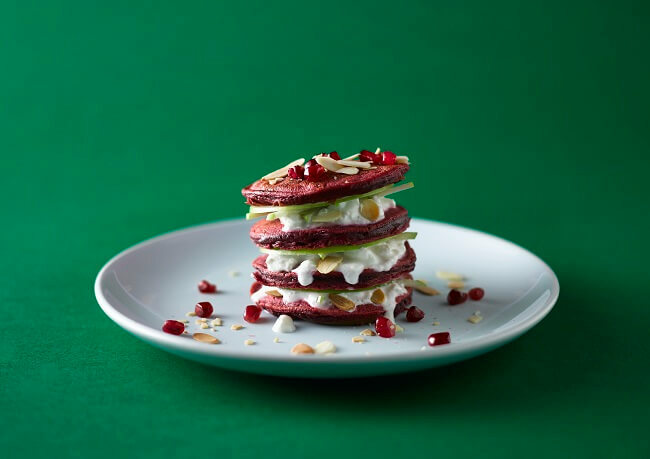 Beetroot and apple might sound like they belong in a salad, but this recipe allows you to turn them into a delicious pancake that perfectly balances these sweet and sharp flavours. Mix the beetroot, eggs, milk and salt in a blender until smooth. Add the sieved flour gradually, mixing well until you get a batter consistency. Mix everything together again to aerate the batter and get a fluffier pancake. Heat a little of the oil in a frying pan on a medium heat. Add some of the mixture to the middle of the pan - remember that it’ll expand during cooking. Fry for 2-3 minutes until one side is golden. Fry for 2-3 minutes until the other side is cooked. Repeat steps 6-10 until all your pancakes are ready. Finish with a spoonful of ricotta cheese and sprinkling of pomegranate and almonds. You’ve probably heard of antioxidants. You probably even know that they’re good for you, but do you know why? Well, they prevent damage to your cells from infections, so they play a vital role in keeping your body healthy. Beetroot fibre has been shown to increase the level of antioxidant enzymes in the body, specifically one called glutathione peroxidase, which is found in many vegetables. Rapeseed oil and eggs are also both excellent sources of vitamin E, which is a natural antioxidant. Beetroot is one of the richest sources of glutamine, an amino acid that’s essential to the health and maintenance of the intestinal tract. Of course, good old fibre plays an important part in the digestive process. The use of buckwheat flour instead of white flour ensures these pancakes are a great choice to support a healthy digestive system. Apples are rich in Vitamin C and simple sugars, such as fructose, sucrose, and glucose. 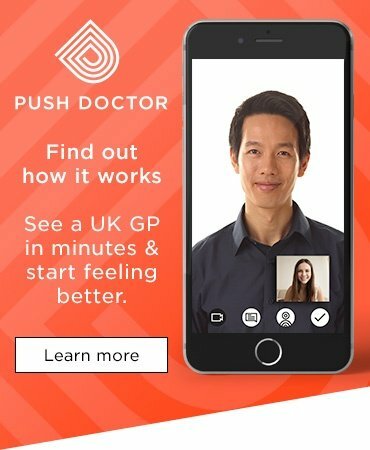 They have a low glycaemic index (around 29 to 44), which means that they cause less of a spike in your blood sugar levels than other foods that contain sugar. Using almond milk and rapeseed oil significantly lowers the fat content of these pancakes. Almond milk contains less than half the fat of cow’s milk, while rapeseed oil is lower in saturated fat than most other cooking oils. If you’re worried that enjoying some pancakes could play havoc with your exercise routine, don’t be! 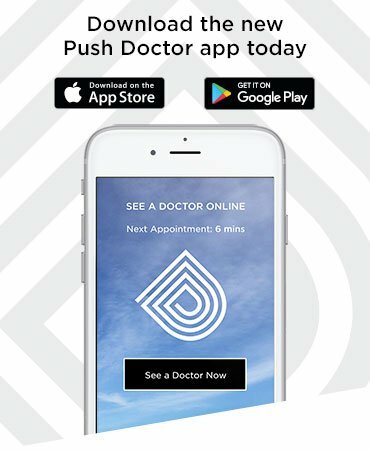 Recent evidence suggests that beetroot may have performance-enhancing benefits during exercise, increasing the blood flow to the working muscles due to its high nitrate profile. Using buckwheat flour also means that there’s an extra protein punch to these pancakes, stimulating muscle repair and weight loss. Banana and cinnamon is a tried and tested dessert combo, and it’s put to good use here in these delicious, healthy pancakes. Add a light, tasty mix of fresh berries and yoghurt and you're onto a real winner! Who said indulgence has to be bad for you? Mix the banana, eggs, almond milk and cinnamon in a blender. Mix in the flour and whey protein. If the batter looks a little thick, loosen it with a dash of almond milk. Mix again to aerate the batter and get a fluffier pancake. Heat a little oil in a frying pan on a medium heat. Pour some of the pancake batter into the centre of the pan. Remember that because of the added protein powder, these pancakes will rise a lot more than normal, so leave plenty of space. Fry for 2-3 minutes until one side is golden brown. Cook the other side for 2-3 minutes until golden brown. Repeat steps 5-9 until all the mixture has been used. Stir the honey and mint into your yoghurt. Garnish your pancakes with the yoghurt and berries. The average egg contains about 4.6g of fat, but three quarters of this is the good, unsaturated kind, which actually helps to lower your cholesterol levels. Bananas, as you probably know, are a significant source of potassium, which has shown to lower blood pressure and have positive effects on cardiovascular health. Cinnamon is classed as a superfood, containing a range of antioxidants (which fight diseases) and anti-inflammatories (which relieve muscle soreness and age-related symptoms). Additionally, cinnamon is known to have an anti-diabetic effect. It helps lower blood sugar levels and can improve sensitivity to the hormone insulin, which is vital for keeping blood sugar levels balanced. As their name suggests, these healthy pancakes a crammed full of protein-rich ingredients. 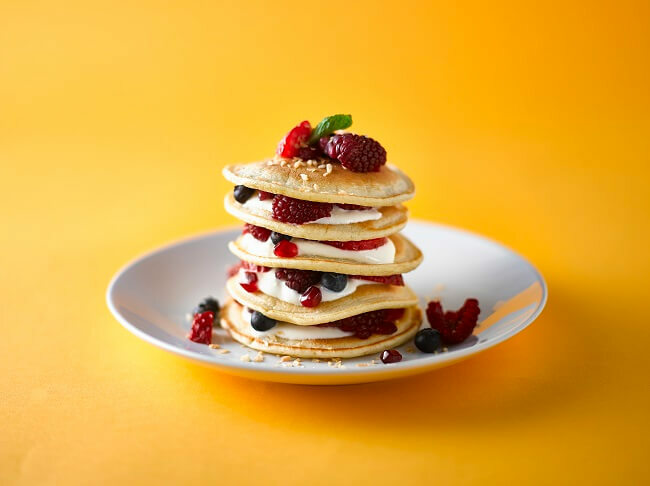 Whilst it’s not essential, a scoop of whey protein gives these pancakes an extra dose of this important nutrient, making this pancake a great post-exercise meal. Whey is rich in a branched-chain amino acid called leucine, which is a large contributor to muscle growth. Of course, you’re also getting a healthy dose of natural protein from the eggs in your batter. These pancakes add texture by using oats instead of flour, while the combination of cottage cheese and banana creates a wonderful creamy flavour. A classic topping of bacon and maple syrup adds the perfect balance of savoury and sweet. Mix the oats, eggs, cottage cheese, banana, almond milk and baking powder in a blender to create a thick batter. If it looks too thick to pour, add a little more milk. Mix again to aerate the mixture and create a fluffier pancake. Pour some of the mixture into the centre of the pan. Cook for a further 2-3 until golden brown. Repeat steps 4-8 until the batter is used. 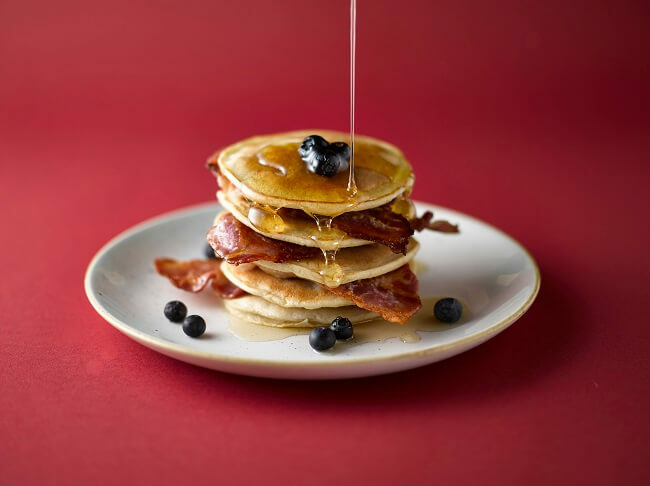 Top the pancakes with bacon, drizzle over the maple syrup and garnish with blueberries. Oats are a very good source of fibre, especially beta-glucan, which is great for your gut. They’re also high in vitamins, minerals and antioxidants. Oats are the only source of a unique group of antioxidants called avenanthramides, believed to have protective effects against heart disease. Due to their beneficial health effects, such as lowering blood sugar and cholesterol levels, oats have gained considerable interest as a health food. You probably don’t spend a lot of time thinking about your selenium levels, but this important nutrient is an antioxidant that helps fight the aging process, while it also supports immune system function. The cottage cheese in these pancakes provides all the selenium you need in a day. As well as selenium, cottage cheese is high in calcium, an important component of healthy bone tissue. Getting enough calcium in your diet helps your heart, muscle and nerve function, too. Almond milk and eggs are also rich in calcium. You’ll be getting a healthy amount of this nutrient from three low-fat sources. Maple syrup is rich in a number of essential minerals, such as zinc, iron, potassium and calcium. It also has a number of powerful antioxidants. Of course, it's also pretty high in sugar, so exercise caution to avoid using too much. If you feel like pushing the boat out, smoked salmon is a real treat. The deep flavour combines perfectly with the asparagus in this delicate French-style pancake to create something truly special. Mix the almond milk, eggs, mirin, salt and pepper in a blender. Stir in the flour gradually. You will be left with a mixture that has the consistency of scrambled eggs. Heat a little oil in slowly in a frying pan. It should be hot, but not smoking. Add some of the mixture and stir until it covers the bottom of the pan. These pancakes are not supposed to be thick, so only use enough to cover the pan. Cook for 2-3 minutes on one side, then slide the pancake out of the pan. The residual heat will be hot enough to cook the other side. You not need these pancakes to be golden brown. Repeat steps 3-5 until all the mixture is used. 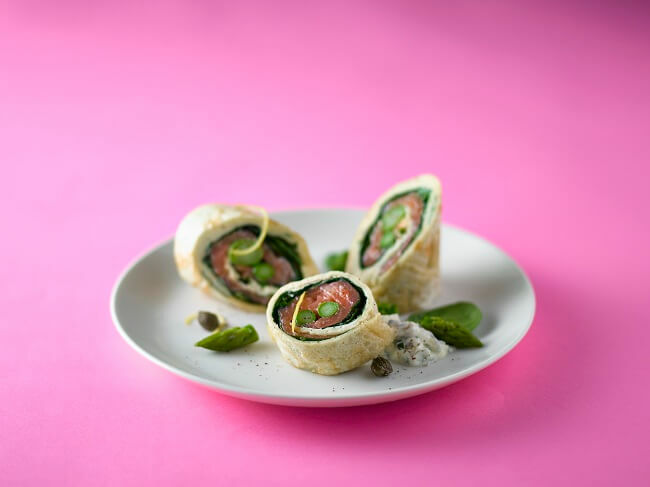 Place some spinach, smoked salmon and asparagus into each pancake, then roll into a cigar shape. Warm your pancake in the microwave for 30 seconds. Mix your capers, lemon zest and creme fraiche. Serve your pancake with a spoonful of the creme fraiche. Government nutritional guidelines state that we should be eating two portions of fish a week. One of these should be an oily fish and salmon falls nicely into this category. It’s packed with healthy fats, including omega-3s, which are beneficial for brain health, cardiovascular health and bone lubrication. It’s found in eggs and rapeseed oil, but the biggest provider of Vitamin E in these pancakes is the asparagus. As well as being a natural antioxidant, Vitamin E is essential in improving your skin, hair and nail quality. Spinach is rich in iron, a mineral that boosts red blood cells and is important for several vital human metabolic functions.